Blossom Feminine Pro is a premium version of Blossom Feminine free WordPress theme. With this premium version, you get to choose from multiple layouts of headers, sliders, featured areas, sticky post areas, home pages, and single post pages and get inbuilt Google Adsense optimized Advertisement areas, plus all the features of the free version. Blossom Coach Pro is the premium version of Blossom Coach WordPress theme. You can use it to create websites for life coaches, health coaches, mentors, speakers and therapists. The theme has tons of features and is designed with many Call to Actions (CTA) buttons to increase email subscription and conversion. You can easily build a great looking functional website without any coding knowledge. 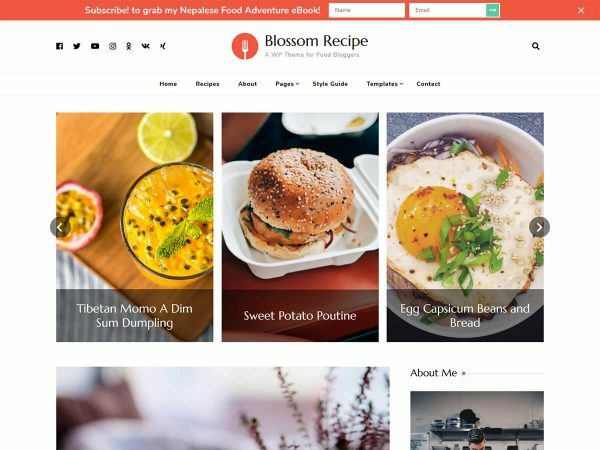 Blossom Recipe Pro is a fully responsive, feature-rich, and gorgeously designed premium WordPress theme to create recipes blog. This theme can be a perfect choice to create a food/recipe blog and share your delicious recipes to the world. Blossom Recipe Pro theme makes it easy for you to share your cooking knowledge with design that supports clear understandable instructions. 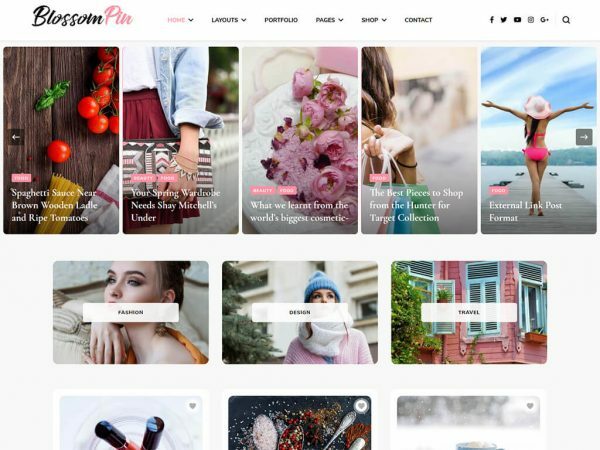 Blossom Pin Pro: A clean, fast, and beautiful premium WordPress theme for every kind of modern blogging needs. Blossom Pin Pro is the premium version of Blossom Pin. Blossom Spa Pro is a premium WordPress theme that will impress your visitors and bring in more customers at the doorstep of your beauty care business or wellness center. The theme is perfect for businesses looking to create a beautiful and UX/UI optimized website without making a hole in their pocket. Blossom Themes presents you a gorgeous, easy-to-use free feminine WordPress blog theme because money shouldn’t stop your dreams. With Blossom Feminine, you can create a cute (or bold) blog without writing a single line of code. 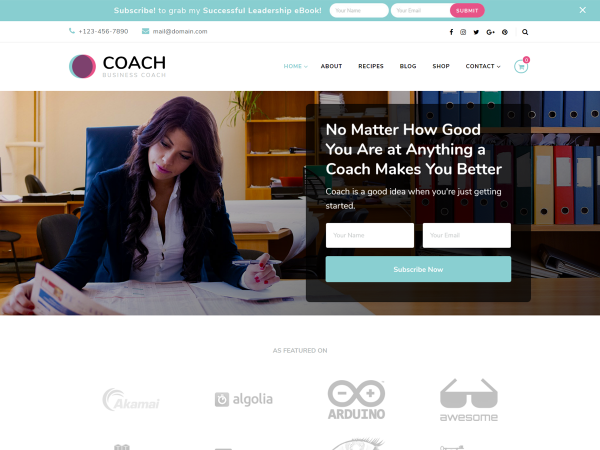 Blossom coach is a free WordPress coach theme designed to create websites for coach, mentors, speakers and therapists. You can easily use this theme to create stunning website without any knowledge of coding. The theme is designed with features that highlights you and yours services that will help to improve your followings. 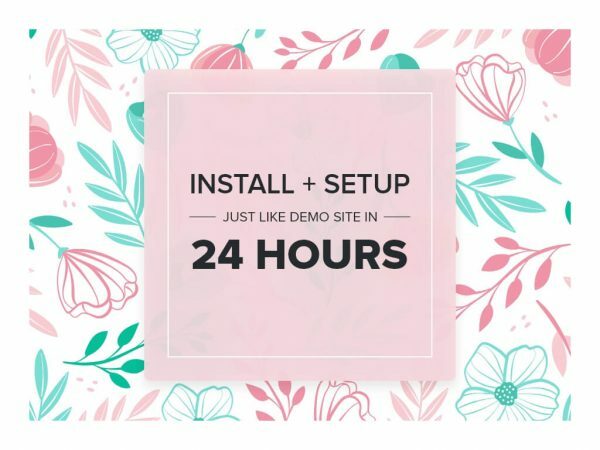 Blossom Beauty is a child theme of Blossom Feminine Free WordPress Theme to help you create a cute and girly feminine blog. 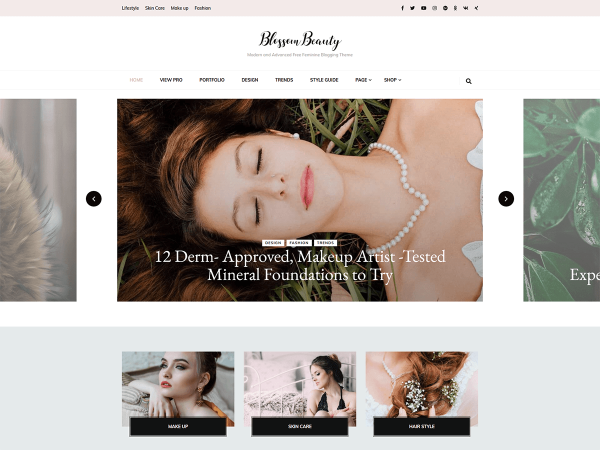 Blossom Beauty Blog is a clean, pretty and free feminine WordPress theme which will help you create a visually appealing and fully responsive blog without writing a single line of code. 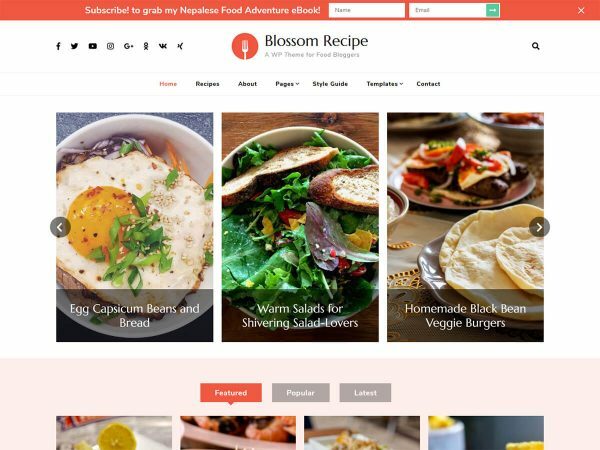 Blossom Recipe is a fully responsive free WordPress theme for cooking enthusiasts and food bloggers to help them share their recipes to the world. This theme features a clean, and visually appealing layout to keep your visitors engaged on your blog. Blossom Pin: A modern masonry layout theme with advanced features for stunning your audience. 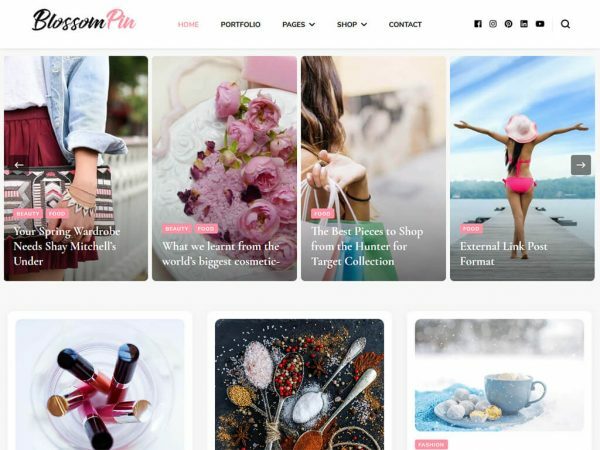 Blossom Pin is a stylist Pinterest-style free WordPress theme with an infinite scroll feature. 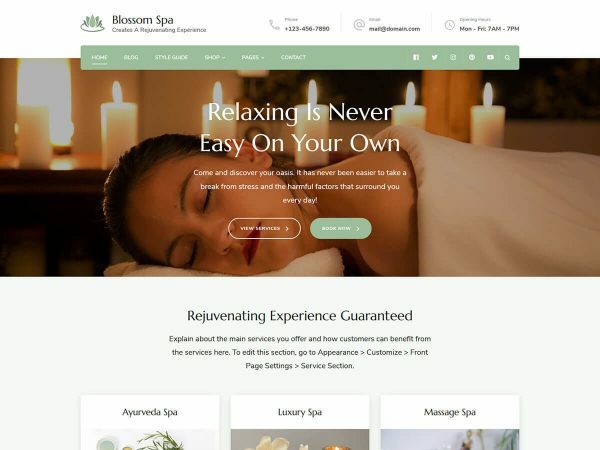 Blossom Spa is an alluring free WordPress theme for spa, beauty salon, wellness center, massage parlor, yoga studio, meditation classes, and natural health care businesses. Whether you want to create a rejuvenating website or want to give a fresh look to your old website, Blossom Spa is the theme for you. Blossom Chic is child theme of Blossom Feminine free theme for aspiring female bloggers! 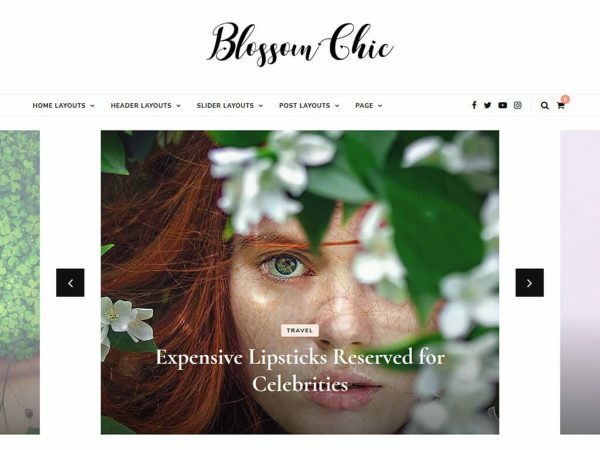 Blossom Chic is an elegant WordPress blog theme that can help you create beautiful blogs without writing a single line of code. Get all our themes at a discounted price. With Yearly Access membership, you get 1-year access to our current theme collection, new theme releases, updates to your themes and priority email support. With Lifetime Access membership, you get lifetime access to our current theme collection, new theme releases, updates to your themes and priority email support. I tried 19 themes before I settled on Blossom. The customization options are amazing, the theme is pure quality, and the support is out of this world. Just ask and they will answer. It’s also WooCommerce compatible. An absolutely amazing theme. Testimonial link. This theme is all what I needed, its a treasure of features for a free theme in conjunction with its free plugins, altogether is better than many professional themes, not to mention a great support, even for a free theme. Testimonial link. I spend an abnormal amount of time searching for the right blogging theme. This one (Blossom Fashion) ticks all the boxes – lightweight feel, customisable, sliders, featured areas, footer widget areas, typography changes, and even has its own plugins you can install for the best looking site possible. I contacted support and got a message back very quickly when i had a problem. Very happy! Thank you. Testimonial link. A great theme (Blossom Feminine Pro) that is both appealing and professional and most importantly very customizable. The support is beyond amazing! Shivani was very prompt in addressing a fix that I requested and continued to follow up until I was 100% satisfied! Testimonial link. The best support for a beginner. Love the theme. Shivani Lama was great to work with. Testimonial link. I have been using WordPress for a while developing my site and I have used many templates before. This (Blossom Feminine) by far is the most stylish, and sharp. The best component of this theme is the thorough documentation and the support I have received so far! I have been lost in the weeds with other themes and they have been great here. Thank you! Testimonial link. Ever wanted to create beautiful websites that are SEO-friendly, mobile friendly and easy to use? Start with our free themes which have tons of features! And, if you need more features, you can always seamlessly upgrade to the premium version.